One Delicious Dish: Roasted Sweet Potato Soup at Highball & Harvest — Rona. It was meant to be a simple luncheon at Highball & Harvest. I was meeting the publicist for Grande Lakes, the two-resort complex in which the New Southern restaurant resides at the ground level of the Ritz-Carlton Orlando. She ordered the soup-salad combo, and so did I, albeit mine with the harvest salad, hers kale. Just lunch. 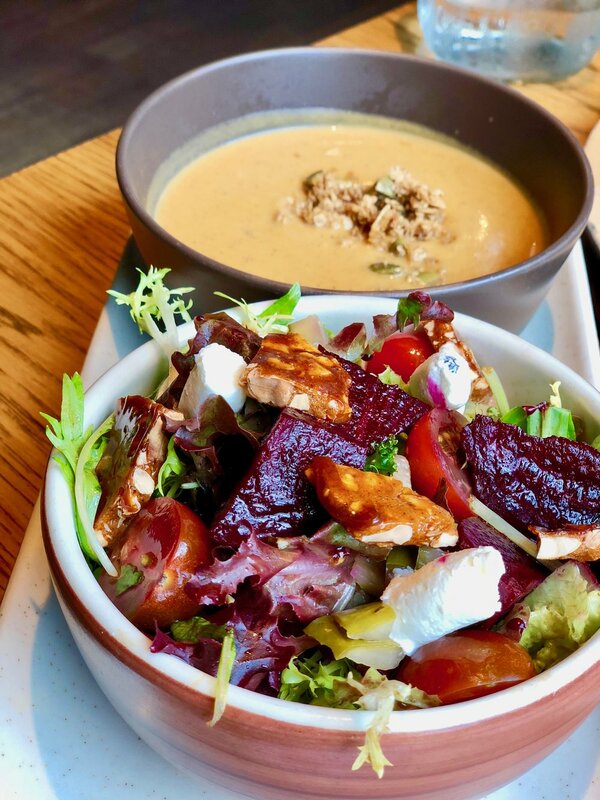 Just soup and salad. Then I took a spoonful of the soup, called Roasted Sweet Potato Soup. Crazy stuff. The soup grabbed me, stunned me. It had a vibrant sweet potato flavor, laced with seasonings, yet it was savory. Most soups like that – butternut squash, pumpkin – tend to be sweet, nearly cloying. I balk. Not this one. It tugged, truly. One more bite. Another, it urged. It had this substance, like a liquid meal, with a texture that was neither dense nor thin, nearly custardy in its richness. What's more, a crisp granola added a complementary texture. That was all by design, according to Sous Chef Jeremy Soares. "We wanted to do a soup for the masses that's approachable, that people would really love," he says. "Sweet potatoes are near and dear to Southerners, reminding them of their grandmothers' houses. I feel people want simple foods sometimes nowadays." Here's the harvest salad. I'm ignoring it because this post is about the roasted sweet potato soup, but the salad is worthy of its own feature. I chose it only because I saw it had red verjus braised beets, and I adore beets in salad; I didn't read further. The salad is comprised of ultra-fresh mustard greens as well as whipped feta (phenomenal), little heirloom tomatoes, and an almond brittle that also deserves its own spotlight. Sweet potatoes are at their height in Orlando in March, Soares notes, so he considers them a spring foodstuff. "We're looking at their peak season right now," he says. "We'll know when the season is over as the sweetness and starch fall." That will be in about a month, he predicts. For now, he and his culinary team go sweet-potato nuts. "We roast sweet potatoes whole, which protects them from the oven," Soares explains. "That really concentrates the sweet potato down so it maintains a sweet potato flavor rather than a roasted flavor." (Chefs talk like this. It's so much fun to listen.) Separately, they roast other vegetables including onion, plus garlic and aromatic herbs. 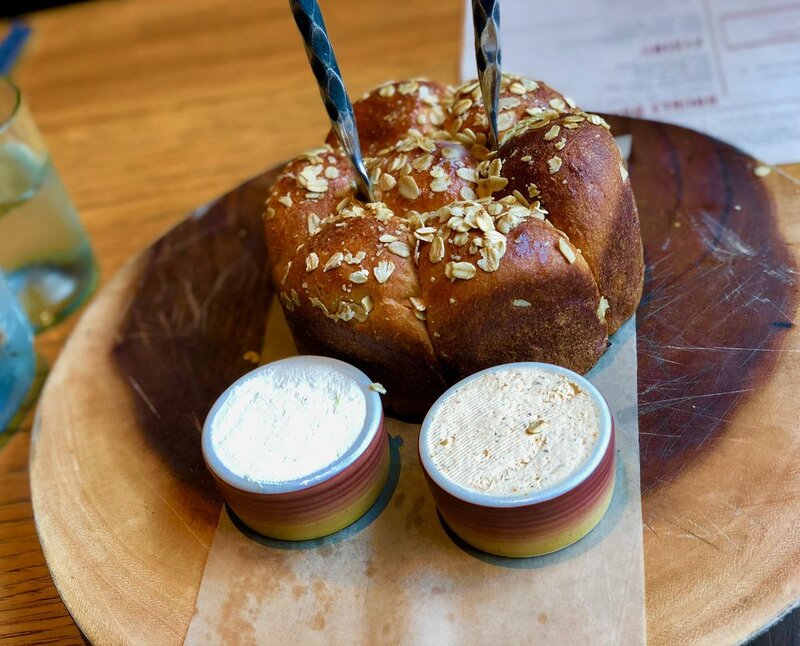 Parker House rolls have been a Highball & Harvest staple since Day 1. Here, the cushiony pull-apart loaf is served with two types of butter: lemon-herb, on the left, and Cajun, on the right. Next up, they peel the sweet potatoes and place them in a pot with the other roasted items. "We throw in some cream, some chicken broth and some spices,"he says, "and basically let it kind of marry together for five or six hours hours. [Imagine having the luxury of time to do that at home.] Then we'll blend it. At the end, we'll finish it with a touch of sugar if it's needed, which it will as we get into summer, but it doesn't right now." In fact, Soares is cautious with sugar, as well as with baking spices and cinnamon. Less is more, for sure. "We won't want to get too far into realm of sweet," he insists, calling that kind of overload "a mistake." After discovering an especially good granola in St. Augustine, Soares re-created it at Highball & Harvest, then decided to sprinkle the granola crumblings on top. "I just wanted to add the nuttiness, the coconut and other flavors," he shares, "the almond, the oats and things like that. 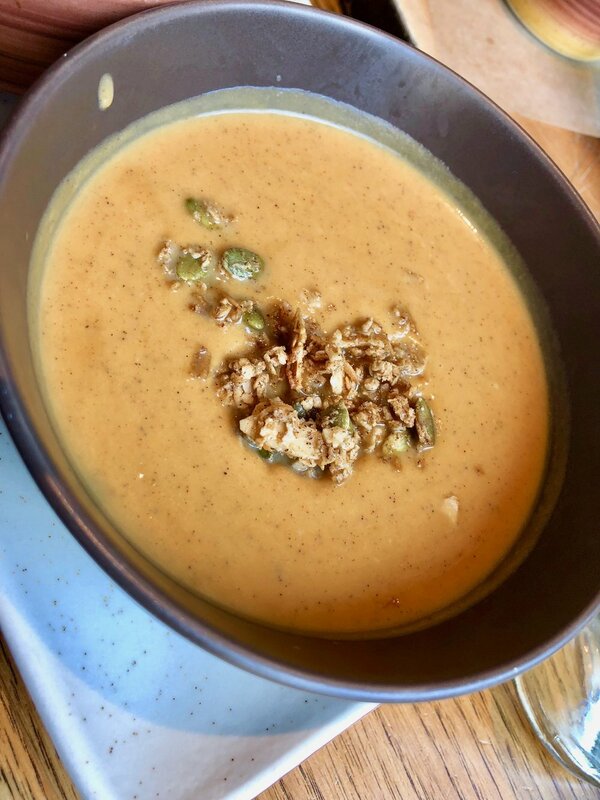 The granola elevated the soup a little." And how. 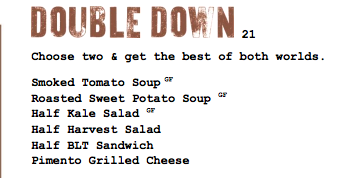 You can go have a full meal at Highball & Harvest, but honestly a soup and salad combo alone is worth the trip. If you run into Soares, encourage his inner Southern matriach by calling him Grandma. In a Southern accent. I bet he'd see it as a compliment. P.S. Ask for the restaurant hostess to stamp for your parking ticket, and you'll be able to valet for only the cost of a tip.